 The initial scent of the salty lowcountry marsh seems to dispose of all extraneous distractions. Cruising over the bridge consists of windows-down, excessively loud music and a convenient inspection of the wind you’ll be battling for the day. Today is the rare late Winter occasion where there isn’t much of a breeze and the sun has asserted its dominance amongst the few scattered clouds. The skiff lies in wait as my Dad and I rappel down to the boat ramp loaded down with fly rods, coffee and a rather familiar “what did we forget this time” mindset. We idle down the Intercoastal with high hopes and a set plan. The wind picks up as the tide turns and we hit open water. With the tide pouring in and a slight chop hindering our sight fishing plans in the low-tide oyster minefield, we decide to pivot our focus. 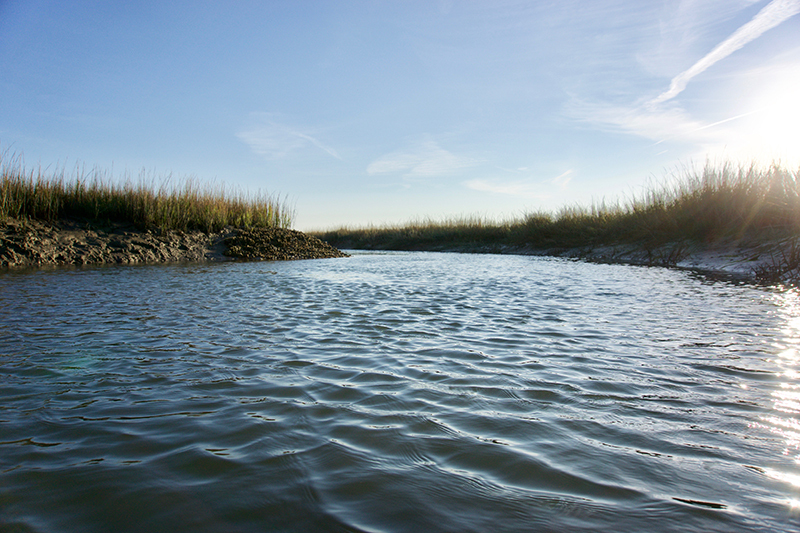 The skiff motors into a U-turn and we begin the voyage toward the creeks in search of some wind-protected water. Winding through crab traps, oyster bars and a few dolphin, we come off plane and raise the motor. I grab the push pole as my Dad prepares on the bow, slowly creeping along behind enemy lines. Before we know it, a school of mullet spook beyond the skiff which consequently startles a smaller group of redfish. I pole further along to a more obscured break in the creek and stake out the boat, readying for the intended target to cruise down the shallow oyster highway. My Dad offers me the bow and our luck begins to turn as a pod of reds recklessly move toward us. I lay a cast out and wait for the lead fish to see the chartreuse and pink fly… Strip, Strip… He inhales it as I strip-set and the chaos begins to unfold. The battle consists of reel then run, reel then run, before the bruiser tires out. We boat him, admire the meaty beast then healthily return him back into the water. The rest of the continued stretch of creek consists of much the same. Spooky fish spook more spooky fish until we perfectly align ourselves to send out delicate casts into promising spots. My Dad hooks into a pup red that proves himself as a force to be reckoned with, swimming head on toward the skiff before being wrangled in. We near the back of the creek with time running out in our low tide expedition. 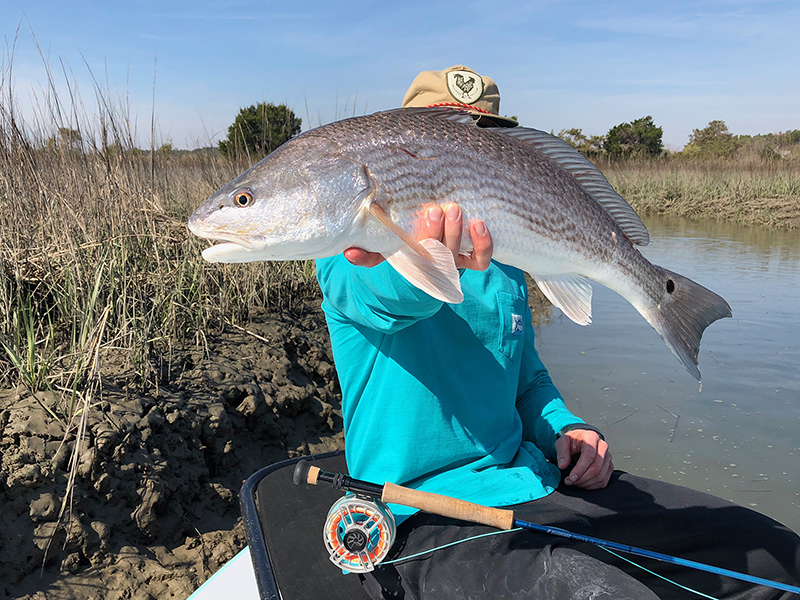 A “one last cast” hail Mary renders a healthy slot red that had somehow not been alarmed by the accidental crunch of oysters beneath the skiff. 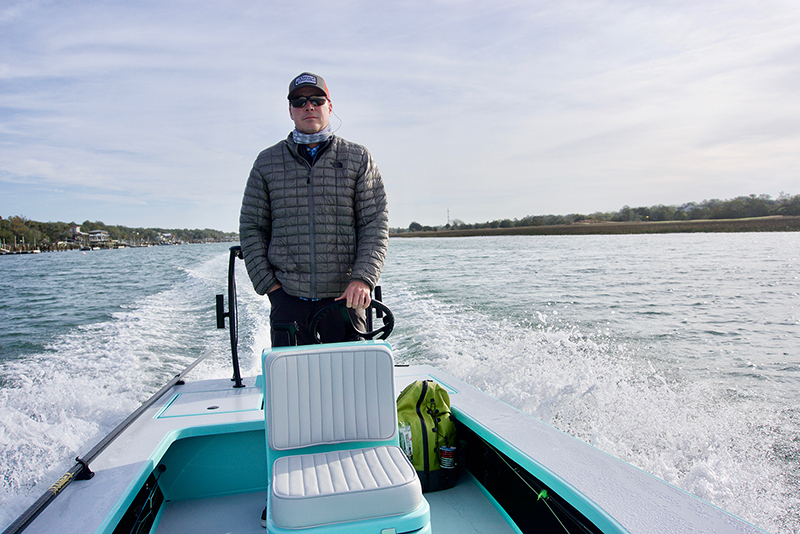 We stake out the boat once more, with no intention of enticing any unbeknownst redfish but to simply take in the beauty of a lowcountry low-tide and laugh about missed shots and clumsy fish. The first day of my senior year spring break at the University of South Carolina will not be one I will forget anytime soon.